They say someone does not officially exist till the government recognises them, even if there are thousands who have benefitted from their existence. Salima Begum is one such individual. Despite having received recognition from the brightest minds in her field, the Gilgit-Baltistan (G-B) government seemingly has little interest in the teacher’s achievements. A resident of G-B, Salima was awarded a medal by the Global Teacher Prize platform on March 19 earlier this year for her outstanding contributions to the field of education in the region. She secured the medal after beating off stiff competition from 20,000 teachers from 179 countries around the world. Her achievement, however, came just days after G-B Chief Minister Hafeezur Rehman gloated over his government’s performance, claiming that steps were being taken to encourage teachers to combat illiteracy in the region. But Rehman’s government has yet to ‘encourage’ Salima. The teacher, though, says the global honour is the vindication she wanted for her efforts. “It is an achievement of which I am proud. I want to dedicate it to the country, my region and its people,” she says. But the award, she feels, is insufficient to support her goal of educating women. “The gold medal is special for many reasons, but I am disappointed because no one from the government has taken any interest in my achievement,” lamented Salima. In stark contrast, 50 finalists of other countries were ‘celebrated’ by their respective governments, receiving awards, cash prizes and recognition and encouragement aplenty from their respective heads of state, Salima pointed out. Pakistan’s Federal Education Minister Balighur Rahman had been invited to the event but did not show up. “This was just disheartening, to say the least,” says Salima, who wants to wipe out illiteracy from her area. The gold medalist wants to increase the quality of education available in her native area by offering training courses. She also hopes to empower women by establishing technical institutions for them. 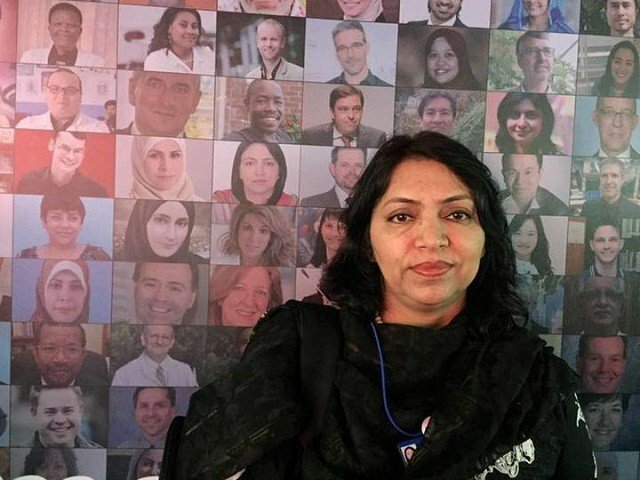 “I also want support people in the field of teacher education,” says the woman who has a Masters in Education in Teacher’s Education and International Relations from the Aga Khan University in Karachi along with a Masters in Philosophy from the Institute of Education at the University of London, and is currently pursuing a Doctorate in Philosophy (PhD) in Teacher Education. Salima also plans to support financially-disadvantaged women so they can meet their academic expenditures. However, her goals require government support. But Gilgit has given no sign that help may be coming anytime soon, keeping her goals firmly rooted in the papers they have been planned on. The latest in those offers was an invitation by the Qatar Foundation to attend the World Innovation Summit for Education (WISE) in Doha.